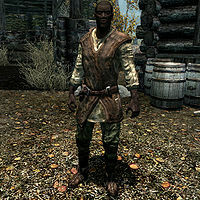 Shadr is a Redguard farmer living in Riften. He works as Hofgrir Horse-Crusher's assistant in the stables. A newcomer from Hammerfell, the unfortunate Shadr recently fell for a scam orchestrated by Sapphire, and now owes her a considerable amount of gold. During the related quest, you will have to convince Sapphire to forget about his debt and leave him alone. Having learned the equestrian trade back in his native Hammerfell, Shadr spends all of his time with the horses, under the watchful eye of stable owner Hofgrir Horse-Crusher. He sleeps in the stable building every night between midnight and 6am and tends to the horses for the rest of the day, at random times taking breaks inside the house for a quick meal. If Hofgrir dies, however, Shadr will change his daily routine completely and will almost abandon his beloved horses. He will still get out of bed at 6am but will start the day with a one-hour meal, then spend all day in Riften, preferably seated on the bench where he is found speaking with Sapphire upon first entering town. At 9am he will browse the market for four hours and will return to the stables for meals at 1pm and 6pm. He wears a set of typical farmer's clothes along with a pair of boots and wields a leveled dagger (up to elven quality at level 20). He carries the key to the stables, a belted tunic and a selection of lower-class items and gold. When working at the stables, Shadr will share his passion for horses and provide a bit of background information on his employer and mentor: "Hofgrir is a great teacher. I've learned so much about horses from him. ", "Horses are all I know. I've been riding since I could walk." and "If the forest wasn't so dangerous, I'd spend every spare moment riding." He will readily elaborate if you ask him directly about his stable work: "Yes. Hofgrir took me in when I arrived in Riften about a year ago. He's been teaching me everything he knows. Horses are my whole life. Back in Hammerfell, I helped my family raise horses at our farm. I hope to open my own stables one day, but I think it's going to take a lot longer than I expected." Sapphire: "I'm really getting tired of your excuses. When you borrowed the money, you said you'd pay it back on time and for double the usual fee." Shadr: "I know I did. But how was I to know the shipment would get robbed?" Sapphire: "Next time, keep your plans quieter and nothing would have happened to it." Shadr: "What? Are you telling me you robbed it? Why? Why are you doing this to me?" Sapphire: "Look, Shadr. Last warning. Pay up or else. All I care about is the gold. Everything else is your problem." Sapphire will then turn around and leave Shadr to his thoughts. He will remain seated on the bridge until you approach him and ask about his problem. When you speak with him, he will say, "Huh? What do you want?" and will then readily tell you about his problem with Sapphire: "I owe a great deal of money to someone and I think they cheated me. I don't know what to do." He will then elaborate: "I was able to work out a deal with the stables in Whiterun to sell me some of their tack and harnesses. I borrowed some gold from Sapphire to pay for the shipment, but it got robbed before it even arrived. Now Sapphire wants her money back, and if I don't pay her, I think she's going to kill me." If you say you are sorry to hear about his problem he will just respond: "Not half as sorry as I am." If you offer to help him, he will be grateful: "You will?! Oh, thank you!" He will then return to his stable work with a warning: "Be careful with Sapphire. She's [sic] mixes with all sorts of nasty people." Sapphire's reaction will differ depending on how long you have progressed in the Thieves Guild quest line; if you have yet to become a member, she will be harder to convince and you will have to either persuade, intimidate or bribe her; if you're Guildmaster, Sapphire will openly admit her scam and will even try and cut you a deal. Naturally, Shadr's responses will differ as well. If you failed to persuade or bribe Sapphire – or if she cut you in on the deal - he will say: "Oh. Well, thanks for trying I suppose. I'll just have to come up with the coin somehow." If you managed to clear his debt completely he will happily say: "By the Eight! You actually talked her into it? I don't know what to say. I didn't think anyone in Riften even cared what happened to me. Look, I was saving this, but I wanted you to have it. I thought I might need it if Sapphire came for me, but I don't need it anymore." Stabilized: Help Shadr clear his debt with Sapphire. Shadr: "Hi, Marise. How are you today?" Marise: "I'm well. How are things over at the stables? Old Hofgrir giving you a hard time?" Shadr: "Naw... he's fine. Look, I wanted to ask if you'll... um, if you'd like to... well, like to have a drink with me at the Bee and Barb sometime?" Marise: "Shadr, that's so sweet... I'd love to." Shadr: "Here's another septim, Madesi. How much more do I need?" Madesi: "Only thirty more and it'll be all yours. If I might ask, who is the lucky woman?" Shadr: "It's for Marise, but don't say a word to her!" Madesi: "Don't worry, Shadr, your secret is safe with me." 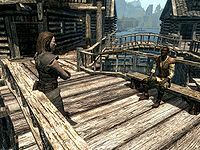 Mjoll: "Have you prepared the stables like I suggested, Shadr?" Shadr: "Yes, Lady Mjoll. If Riften gets attacked, we'll retreat inside the city gates and bar the door just like you said." Mjoll: "Good. You could be our first line of defense since you live outside the city walls, so we're depending on you." Shadr: "Brand-Shei, did you hear about Helgen? It's... it's gone! A dragon burned it to the ground!" Brand-Shei: "Yes, I heard. I think all of Skyrim knows by know." Shadr: "Do you... do you think that could happen here? I mean, could a dragon come here and burn the city down?" Brand-Shei: "I don't know. All we can do is hope the Eight will favor us and have these creatures stay far away from Riften." Grelka: "Did you do everything I said, Shadr?" Shadr: "Yes. The man came by at noon just like you said. I gave him the package and he gave me this pouch for you. The package was heavy... I needed his help getting it on his horse. What was inside?" Grelka: "Hey, I told you not to ask any questions. Now, here. For your trouble."